Early on several different types of maps were experimented with (see the experimental map section below). The Mt. Rainier web pages illustrate many of these early experiments. 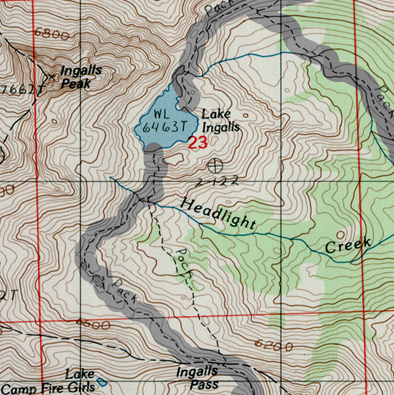 However, most users seemed to most appreciate simply enhancing USGS topographic maps to emphasize trails. These enchantments are described below. The next level of enhancement involves superimposing trail mileage on the map. This mileage is a type of ‘floating scale’ where the color changes every mile (starting with red). 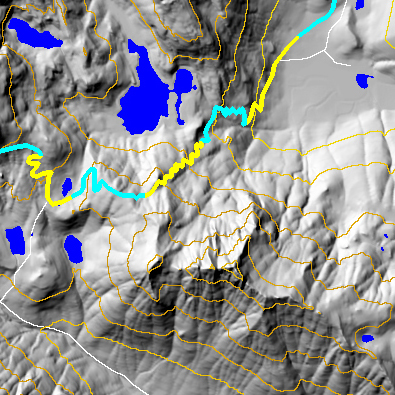 This is different from the normal scale in that it includes elevation changes and reflects trail complexity directly. 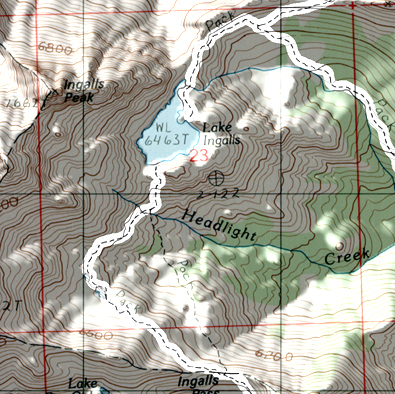 For example, a trail mile with lots of vertical gain and small switchbacks can be significantly shorter on the map then a ‘classical’ map scale that ignores elevation changes and can not resolve the small switchbacks. The last possible enhancement is to add GPS rings. These are created by drawing circles, centered at the start of the trail, at one mile intervals. 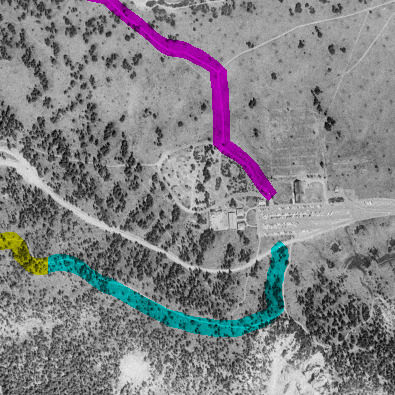 By comparing the ‘crow fly’ distance taken from a GPS from the waypoint set at the start of the trial the hiker can easily locate himself by the intersection of corresponding GPS ring distance and the trail. For the mathematically inclined this can be considered very analogous to polar coordinates. Hikers have found this use of local ‘polar coordinates’ to be much faster than reading the traditional longitude and latitude from the edge of the map. 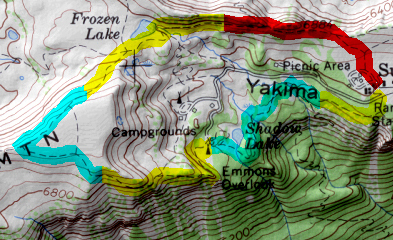 Using high resolution DEM stereo maps were generated for many trails. 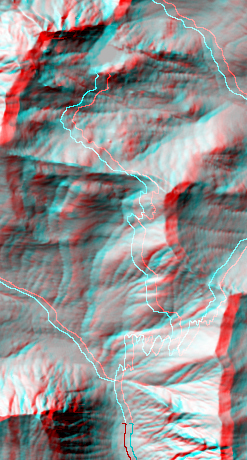 Using special glasses (I can send you a pair if you Email me) the user can use these stereo maps to directly see the topographic relief of the basin in 3D. It is designed to mimic what a person would see from an airplane. These maps are a blend of colored elevation maps and shaded relief maps.